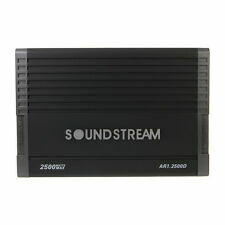 Soundstream Arachnid Series AR1.2500D Amplifier. MONOBLOCK 1-OHM STABLE AMPLIFIER. Class-D 1-Ohm Stable Monoblock Amplifier. 2500 WATT ARACHNID SERIES CLASS-D. 3-way protection circuitry (thermal, overload, and speaker short protection). Soundstream Arachnid AR1.4500D. 4500 Watts Max Power, Monoblock Class D Car Subwoofer Amplifier. Max Power (Watts): 4,500. 12dB Bass Boost Increases Low Octave Harmonics. High/Speaker Level & Low Level/RCA Input. Soundstream Arachnid Series AR1.4500D. MONOBLOCK 1-OHM STABLE AMPLIFIER. Class-D 1-Ohm Stable Monoblock Amplifier. 4500 WATT ARACHNID SERIES CLASS-D. 3-way protection circuitry (thermal, overload, and speaker short protection). 1 ohm: 2500 watts x 1 chan. Tarantula Series Monoblock Class D Car Amplifier. Three-way protection circuitry. Mono channel operation. Military grade SMT PCB maintains dynamic performance. Audiophile grade IRTM transistors. Trending at $279.95eBay determines this price through a machine learned model of the product's sale prices within the last 90 days. SOUNDSTREAM RN1.5000D. Soundstream Rubicon Nano Series 1-Ohm Stable Amplifier. CLASS D 1-OHM STABLE MONOBLOCK. Class-D 1-Ohm Stable Monoblock Amplifier. 5000 WATT PEAK RUBICON NANO. AMPLIFIER WITH REMOTE BASS KNOB. Built In BX-10 Bass Booster Epicenter! Dial-in the exact sound you want by tuning the frequency to boost, then, increase the bandwidth range from that frequency to boost the harmonics around it. 5000 Watts Max Power, Monoblock Class D Car Subwoofer Amplifier. Trending at $147.05eBay determines this price through a machine learned model of the product's sale prices within the last 90 days. Model: ST1.1000D Stealth Series. Car Audio Motorcycle Class D Monoblock 1-Channel 2-ohm stable Amplifier. RMS Power 3-way protection circuitry (thermal, overload, and speaker short protection). Mono channel operation. Tarantula amplifiers continue to dominate the Soundstream amplifier arsenal. For the newest generation, we've maintained their stable performance, but given them a unique appearance. A simple press of the end panel mounted switch changes the color to one of several presets, slow-motion color change, or rapid flashing random color. Soundstream Arachnid Series AR1.8000D. Class-D 1-Ohm Stable Monoblock Amplifier. 3-way protection circuitry (thermal, overload, and speaker short protection). Variable low-pass filter: 40 - 180 Hz, 24 dB/octave. That's why so many car audio enthusiasts choose the Soundstream Arachnid 8000-Watt Monoblock Class D Amplifier.This monoblock amp boasts a max power of 8,000 watts, with 1,500 watts RMS power handling at 4 ohms, 2,500 watts RMS at 2 ohms, and 4,000 watts RMS at 1 ohm. 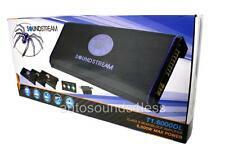 Soundstream T1.4000DL. 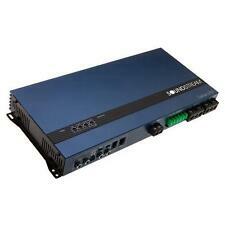 4000W Tarantula Electro Series Mono-Block Class D Car Amplifier. Tarantula Series Mono-Block Class D Car Amplifier. Amplifier Series Tarantula (Soundstream). 3-way protection circuitry (thermal, overload, and speaker short protection). RMS Power Car Audio Class D Mono-Block 1-Channel Amplifier. 3-way protection circuitry (thermal, overload, and speaker short protection). 4 ohms: 800 watts x 1 channel. 2 ohms: 1,400 watts x 1 channel. Built In BX-10 Bass Booster Epicenter! Dial-in the exact sound you want by tuning the frequency to boost, then, increase the bandwidth range from that frequency to boost the harmonics around it. 10,000 Watts Max Power, Monoblock Class D Car Subwoofer Amplifier. Soundstream Rubicon Nano Series RN1.5000D. 5000 Watts Peak Power, Monoblock Class D Subwoofer Amplifier. High Efficiency Class D Monoblock Performance Amplifier. Monoblock Bridging Capability for Double Amplifier Application. Trending at $227.98eBay determines this price through a machine learned model of the product's sale prices within the last 90 days. Ultra Micro Amp-Great for Car, Motorcycle, or Boats! Soundstream Picasso Nano Series PN1.650D. 650 Watts RMS, Monoblock Class D Subwoofer Amplifier. 400W RMS x 1 @ 4 Ohms. 650W RMS x 1 @ 2 Ohms. Virgin Islands and other countries outside the USA. 4-ohm Bridged/2-ohm Stereo Class D Full Range. The ST1.1000D also features high- and low-level inputs for a variety of applications, and includes a low-pass filter to help you tailor your sound. Soundstream Stealth ST1.1000D. MONOBLOCK 2 OHM STABLE AMPLIFIER. Direct Short, Thermal and Overload Circuits Protect Amplifier. 12dB Bass Boost Increases Low Octave Harmonics. Variable 0-12dB 45Hz Bass Boost. Burnt voice coils. 200mV-6V Low Level RCA Input and Pre-Amp Output. Car Motorcycle Amplifier Class D 1-Channel. Mono channel operation. Variable low-pass Crossover(50-250Hz, 12dB). Variable Subsonic Crossover (10-50Hz, 12dB). Small Compact 4.75" Wide Chassis. 4-ohm Bridged/2-ohm Stereo Class D Full Range. Tarantula Series Mono-Block Class D Car Amplifier. 3-way protection circuitry (thermal, overload, and speaker short protection). Mono channel operation. Put the completed RMA FORM inside the box with your item. 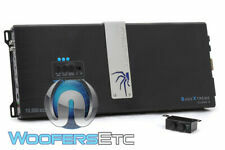 TN1.2000D - Soundstream Monoblock 2000W Class D Full Subwoofer Amplifier. 2000W Max Power. 1-Ohm Stable Class D Monoblock Subwoofer Amplifier. Variable 30-80Hz 0-12dB Bass Boost. Low Level / RCA Input with Bridged Operation Outputs. 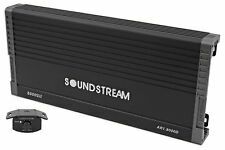 T1.4000DL - Soundstream Monoblock 4,000W Max Class D Amplifier. Direct Short, Thermal and Overload Circuits Protect Amplifier. 12dB Bass Boost Increases Low Octave Harmonics. Variable 0-12dB 45Hz Bass Boost. 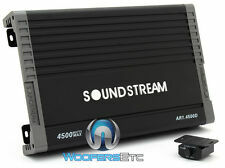 AR1.4500D - Soundstream Monoblock 4500W Class D Amplifier. 1-ohm Stable Monoblock Operation for MAX Power. 12dB Bass Boost Increases Low Octave Harmonics. High/Speaker Level & Low Level/RCA Input. 200mV-6V Low Level RCA Input. 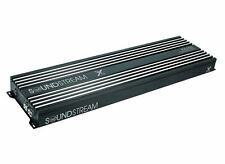 RN1.5000D - Soundstream Monoblock 2,500W RMS Class D Amplifier. High Efficiency Class D Monoblock Performance Amplifier. Monoblock Bridging Capability for Double Amplifier Application. 1-Ohm Minimum Impedance Monoblock Operation. I bought this amp brand new a few years back for a car project I never did. I have never had this amp installed in a vehicle. Not a mark on it anywhere, literally new old stock, has been inside my house climate controlled. It would be a killer amp for my new JL Audio dual 8” sub project but it will not fit in the confined space I would like to use. Soundstream T1.6000DL. 6000 W Max Monoblock Class D Amplifier. 1-Ohm Minimum Impedance Monoblock Operation. Amplifier Install Kit. Direct Short, Thermal and Overload Circuits Protect Amplifier. 6,000W Max Power. 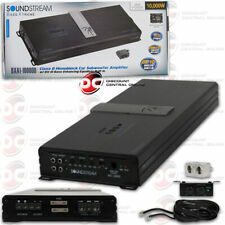 Soundstream Rubicon Nano Series 1-Ohm Stable Amplifier. 3000 WATT PEAK RUBICON NANO. 1 ohm: 1500 watts x 1 chan. Total power output: 3000 watts. CLASS D 1-OHM STABLE MONOBLOCK AMPLIFIER. High level: 200mV-6V. Car Audio Monoblock 1-Channel Class D Amplifier. 1-ohm Minimum Impedance Monoblock Operation. Direct Short, Thermal, & Overload Circuits Protect Amplifier. Digital Bass Reconstruction Processor Built-in. 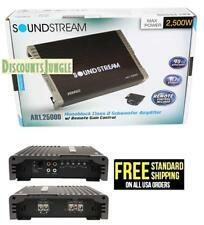 AR1.8000D - Soundstream Monoblock 8000W Class D Amplifier. 1-ohm Stable Monoblock Operation for MAX Power. 12dB Bass Boost Increases Low Octave Harmonics. High/Speaker Level & Low Level/RCA Input. 200mV-6V Low Level RCA Input. Put the completed RMA FORM inside the box with your item. All products are covered by Techronics ' warranty. We areNOT responsible for any custom duties or brokerage fees that may apply for all international orders. Tarantula amplifiers continue to dominate the Soundstream amplifier aresenal. For the newest generation, we've maintained their stable performance, but given them a unique appearance. A simple press of the end panel mounted switch changes the color to one of several presets, slow-motion color change, or rapid flashing random color. 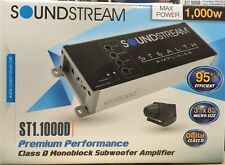 T1.6000DL - Soundstream Monoblock 6,000W Max Class D Amplifier. Direct Short, Thermal and Overload Circuits Protect Amplifier. 12dB Bass Boost Increases Low Octave Harmonics. Variable 0-12dB 45Hz Bass Boost. Direct Wire 0 ga. Power, 4 ga. Three-Way Protection Circuitry (thermal, short, impedance). Fusing 250 Amp External. 12dB/octave Low Pass Filter 50-150Hz. Direct Wire 4 ga. Power, 8 ga. Damping Factor (100Hz, 4 Ohm) >300. BXA1-5000D - Soundstream Monoblock 1650W RMS 5000W Max Bass Equalizer Class D Amplifier. 5000W Max Power. 1-ohm Minimum Impedance Monoblock Operation. Sweep selects the frequency boosted by the equalizer. 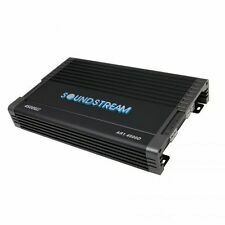 Soundstream X3 Series X3.14K. Soundstream X3.14K. 14,000 Watts RMS Power, Monoblock Class D 1 Ohm Stable Car Subwoofer Amplifier. Class-D 1-Ohm Stable Monoblock Amplifier. This Monster Amplifier will probably MAX at 28,000 Watts! Tarantula Series Mono-Block Class D Car Amplifier. Max power output: 6,000 watts. Put the completed RMA FORM inside the box with your item. Alaska, Puerto Rico, Hawaii, Residents. Signal to Noise Ration: >104 dB.